Dental X-ray examinations provide valuable information that your dentist could not collect otherwise. With the help of radiographs (the proper term for pictures taken through x-rays), your dentist can look at what is happening beneath the visible oral tissues. For answers to common questions please refer to our FAQS. 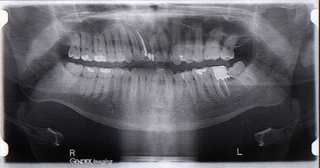 There are three major types of dental x-ray series: the initial full mouth series, the yearly bite wing series, and the Panoramic x-ray film. We take a full mouth series on every adult patient at the initial examination. It consists of bitewing films which are taken at an angle specifically to look for decay, and periapical films, which are taken from other angles to show the tips of the roots and the supporting bone. When taking a full mouth series you may wonder why each tooth is seen in multiple films. This redundancy is important because it gives us lots of information we would not otherwise have. Each X-ray is shot from at least a slightly different angle and the difference in angulation can reveal many different aspects of the tooth in question. Since X-rays are taken in two dimensional quality, it is very helpful to have several views, taken from different angles, of any given tooth. A bitewing series, also known as cavity-detecting x-rays, consists of either 2 or 4 films taken of the back teeth, with the patient biting down so the films contain images of both the top and bottom teeth. A bitewing series is the minimum set of x-rays that most offices take to document the internal structure of the teeth and gums. The Panelipse is a large, single x-ray film that shows the entire bony structure of the skull, as well as the teeth. It takes a much wider area than any intra oral film showing structures outside of their range including the sinuses, and the Temperomandibular Joints. It shows many pathological structures such as bony tumors and cysts, as well as the position of the wisdom teeth. They are quick and easy to take. 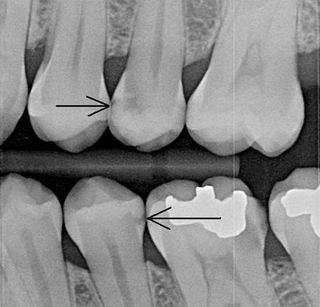 Here's an Xray showing decay in between teeth, right where the arrows are pointing. These cavities would not be visible just by looking, and probably would not be causing the patient any pain. Yet. The top decay is getting close to the nerve of the tooth. Good thing this patient shoed up when they did - toothache was avoided!